In todays constantly changing market there are a variety of table and floor mats. The best way to make an informed decision about which floor or table mat is best for your application is by understanding how a mat works, and the abilities of each mat type. A static mat is designed to drain the static charge from items placed on the mat. This step is important because static can damage electronic devices. Mats also protect bench tops from damage and wear of everyday use. For a mat to effectively ground an item on its surface, the item must be electrically conductive or dissipative. Electrically insulative items, like most plastics, will not allow their charge to drain to the ground. In order for the mat to work properly it must be able to conduct electricity. The range of conductivity is important for the following reasons. ~If the mat's resistance is too low, static will transfer to the mat so fast that it will cause a spark. This spark would be an electrostatic discharge (ESD) and will damage electronic devices. ~If the mat's resistance is too high, static will transfer to the mat so slowly that the items placed on the mat will not lose their charge. 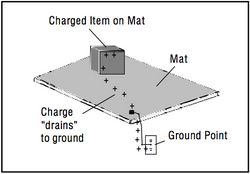 When the item is removed from the mat, it will have a static charge and be capable of discharging to other items.